Enjoy cooking home-made meals using the new Taste Symphony 24cm Casserole. 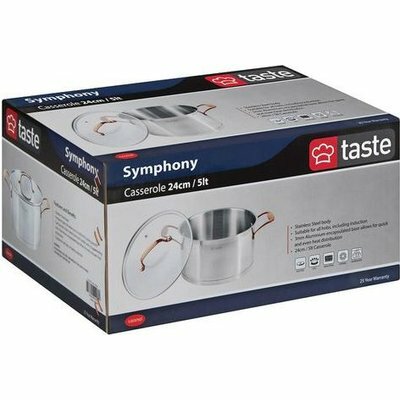 Taste has been made using quality Stainless Steel and has cast stainless steel cool-touch handles. This cookware is suitable for all hobs including induction and may be used in the dishwasher. The 3mm Aluminum encapsulated base allows for quick and even heat distribution. Please ensure that all labels are removed, the product washed with dishwashing liquid and dried thoroughly before using for the first time, proper use and care will ensure that this cookware will last. The use of sharp utensils such as stainless steel whisks, knives or forks may scratch the surface of your cookware and it is therefore advisable to use wooden or nylon utensils in order to prevent this from happening. 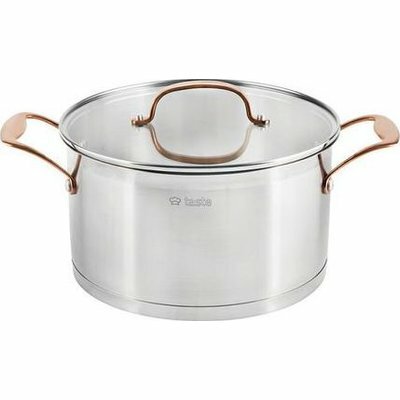 Please note that your cookware performs best on the stove with the lid on, saving both time and energy. Be careful not to place your lid on or near a hot plate whilst it is not in use, although the glass lids are made from strengthened tempered glass, they can be broken if not handled with care. This product is recommended for the dishwasher, however, hand washing with warm water and dishwashing liquid is recommended as the best way to preserve the look of your cookware as over time strong dishwasher detergents may a ect the appearance and performance of your cookware. Do not store your cookware when damp or wet. Children must be supervised by a responsible adult when in uses.